This morning I decided to go ahead and upgrade KDE to the latest, stable release. I had grown weary of this Linux desktop because of instability issue as well as lack of compelling reasons to use it. Even so I have tried to keep as up to date as possible, in order to continue to cover this Linux desktop option. Today's upgrade may have changed my mind all together about this particular desktop. KDE now enjoys a very similar feel it had with 3.5. It's solid, reliable, beautiful, and user-friendly. But is it enough to make you want to use it? Let's first install it and then poke around a bit. Issue the command sudo /etc/apt/sources.list. Uncomment out the line deb-src http://us.archive.ubuntu.com/ubuntu/ karmic-backports main restricted universe multiverse. Issue the command sudo apt-get update. Open up your update manager. Log out of your desktop. Log back into, making sure you choose KDE as your desktop. You should now be running KDE 4.3.5. You can check by opening up the Dolphin file manager and click the Help > About KDE. You should see KDE 4.3.5 as shown in Figure 1. Once you have verified that the update was successful, play around for a bit. What is the first thing you notice? For me it was that everything seemed to really feel stable and much, much speedier. Prior to this update KDE still seemed a bit unsure of what it was going to do next and it felt sluggish, even on a fairly modern, dual-core machine. That seems to be a thing of the past. 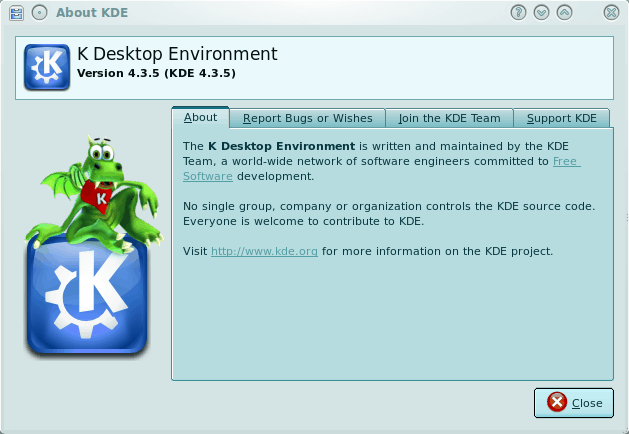 What should surprise you the most is how few updates KDE 4.3.5 brought to the table. If you read the full changelog you will find 25 bugs were squashed. That's not many. So either KDE has obfuscated the rest of the bug listings or the bugs they resolved were fairly serious in nature. It also seems the Compiz support is getting better and better with each release. Although Compiz is not nearly as fully realized in KDE as it is in GNOME, it is getting to the point where KDE and Compiz play well together. Without a doubt, if you are a KDE user, this is a must-have update. If you are running any version of KDE 4 earlier than 4.3.5 you owe it to yourself to upgrade. And if you're not currently a KDE users, now is a good time to give this desktop a try. Why? With the latest release of KDE comes a desktop that might well win you over from GNOME or any other desktop. And if you're unsure, give Figure 2 a look and see what you are missing. What you see here is the coverflow-like application switcher default in KDE 4.3.5. The most exciting prospect of KDE 4.4 is the social desktop and the netbook Plasma. 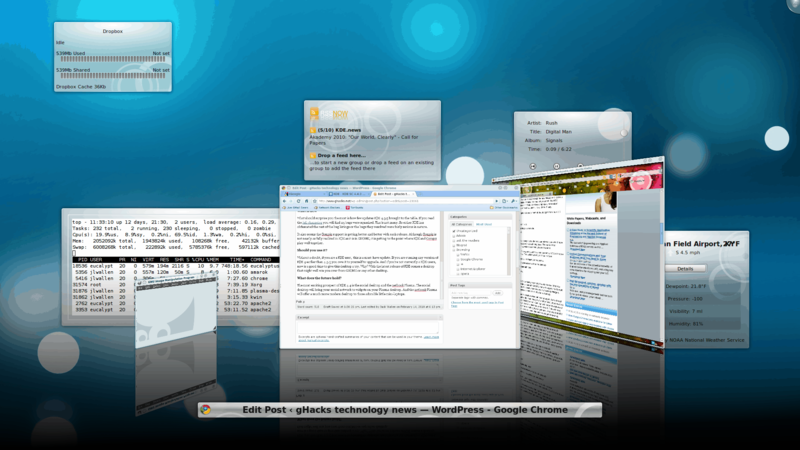 The social desktop will bring your social network to widgets on your Plasma desktop. And the netbook Plasma will offer a much more modern desktop to those adorable little mini-laptops. KDE now enjoys a very similar feel it had with 3.5. It's solid, reliable, beautiful, and user-friendly. But is it enough to make you want to use it? Let's first install it and then poke around a bit. I think you’re a bit late on this one… 4.3.5 was released some time ago, the latest stable release is 4.4.
no thank you. i don’t like widgets. yes, 4.4 is out. i was a bit behind with KDE and wanted to do the upgrade step by step. i am now upgrading to 4.4 and will report on that as well. KDE 4.4 offers some serious technical changes – as a software consumer, I’m *very* interested in its technologies, but I’m not willing to upgrade to it until it’s supported by my distribution. Specifically, I’m not sure if installing KDE 4.4 will be a seamless transition for the database underlying its desktop search and email technologies.